Buyer personas are fictional, generalized representations of your ideal customers. They help you understand your customers (and prospective customers) better, and make it easier for you to tailor messages and offers or calls-to-action to the specific needs, behaviors, and concerns of different groups. With the How to Create Buyer Personas Guide, you will learn how to create your buyer personas, and get templates for developing them. 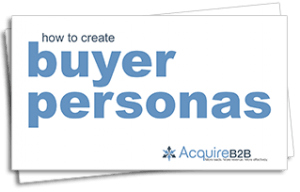 Just complete and submit the form, and your own copy of the How to Create Buyer Personas Guide will download in seconds.